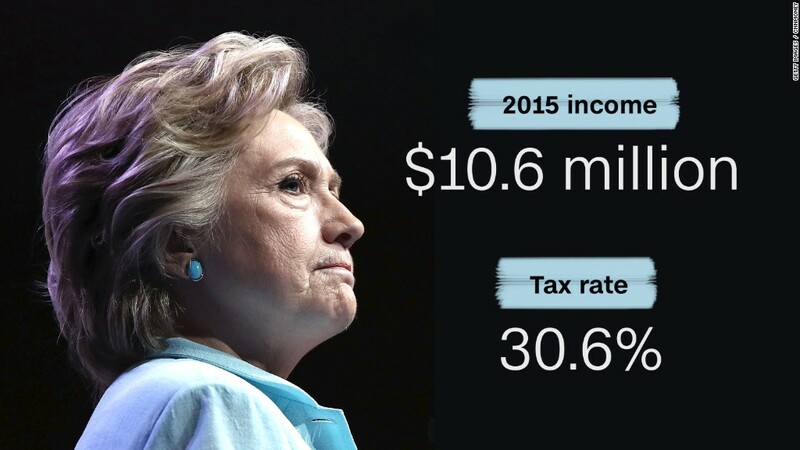 After hammering Donald Trump on the campaign trail for refusing to reveal his tax returns, Hillary Clinton released her latest federal income tax return Friday, showing she and Bill paid roughly a third of their multi-million dollar income to Uncle Sam. The Clintons pulled in $10.6 million in 2015, much less than the nearly $28 million they made the year before. Their tax return showed that they paid $3.24 million in federal income taxes. That means their effective tax rate -- a measure of their income tax burden -- was 30.6% based on their adjusted gross income. That's on par with their 32% effective rate in 2014. The campaign reported the Clintons' effective tax rate as 34%, which includes the more than $300,000 the couple paid in self-employment taxes, which are payroll taxes for Social Security and Medicare. Experts often don't include them when calculating federal income tax burdens. By any measure, though, Hillary Clinton and her husband have satisfied the Buffett Rule that she'd like to impose if elected. Under that rule, anyone with adjusted gross income over $1 million would have to pay a minimum of 30% of their income in taxes. The Clintons primarily made their money in two ways: speaking and writing. Together they made $6.7 million in speaking fees. That's well below the roughly $20 million they made the year before. They also made close to $3.1 million on their various books. And Bill Clinton's consulting business brought in nearly $1.7 million. The couple also received $226,000 in pension and annuities. As a former U.S. president, Bill Clinton is entitled to receive a pension north of $200,000 a year. They made another $109,000 in interest and dividends, and claimed $3,000 in capital losses carried over from prior years. The couple gave $1 million to their private Clinton Family Foundation, which is different than the Clinton Foundation that has been the subject of scrutiny. With the release of her 2015 income taxes, Clinton has now released 39 years' worth of tax returns over the course of her career. Her opponent Donald Trump has yet to release any tax returns, a fact she brings up regularly. Trump says he's not releasing them because he's under audit and said he would when the audit is complete. In fact, there is nothing preventing him from doing so during an audit. By not releasing them during the campaign, he is breaking with a 40-year bipartisan tradition of transparency expected of presidential nominees. The fact that he won't release his taxes has raised questions about the actual size of his fortune and some of his businesses connections. And it's also led to his critics alleging he pays very little in income taxes. Without seeing his returns it's impossible to say. But tax experts note that as a real estate investor he's entitled to a bevy of tax breaks that can greatly reduce his tax bill. Some of the most advantageous ones: writing off the interest paid on loans financing the properties and a favorable depreciation schedule to account for a property's wear and tear. "You can recover the cost of the building over time, even though they typically appreciate in value," said Steve Rosenthal, a tax lawyer and senior fellow at the Tax Policy Center. But one of the biggest breaks of all, Rosenthal said, is what's called a like-kind exchange. That lets real estate developers swap one property for a very similar one without having to pay capital gains taxes on the original property. It also lets them escape taxation if they sell a property and put the money in trust so long as it's designated to acquire a similar property in the near future. Clinton's running mate, Tim Kaine, released 10 years' worth of returns. In 2015, Kaine and his wife, Anne, reported $313,441 in adjusted gross income and paid nearly $63,000 in federal income taxes for an effective rate of 20%. The vast majority of their income -- nearly $312,000 -- came from their salaries. To date there has been no indication whether Trump's running mate, Mike Pence, will release his returns.